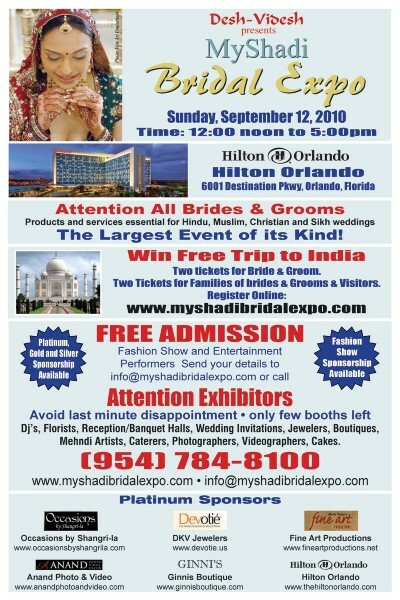 See us at the Desh-Videsh MyShady Bridal Expo. It will be Sunday September 12, 2010 from 12 noon – 5:00 pm. This is a FREE bridal show, but will be packed full of brides & their families looking for a photographer for their Indian, Hindu, Muslim, Christian and Sikh weddings. It will be at the Hilton Orlando 6001 Destination Parkway. This will be an excellent opportunity to meet us and see some of what we have to offer for your wedding photography & videography. Stop by to say “Hello.” We have a special gift for you!